Winter is a magical time to photograph the natural world. The world is changed with the white of snow or frost. Trees become dormant for the season, and visually become lines in the composition. The temperatures drop below freezing, and it is a different environment for operating a camera. Exposure changes to reflect white. 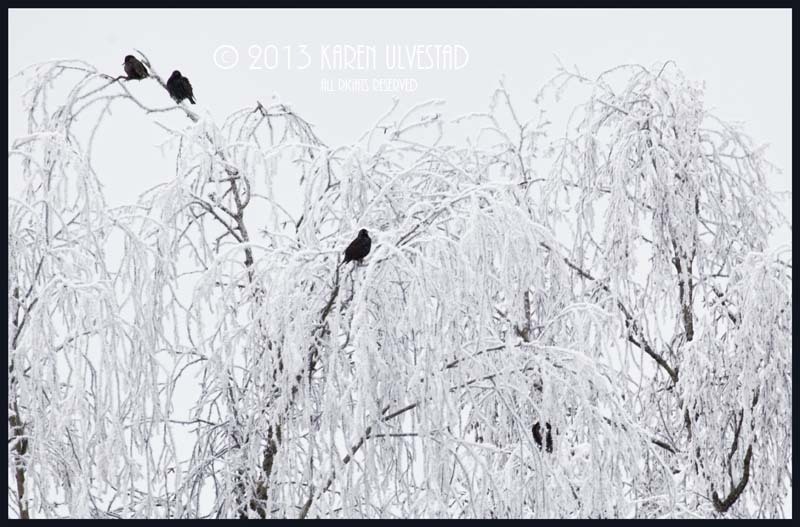 Below is a photograph of starlings in a tree covered with hoarfrost. The dark tone of the birds is in direct contrast to the white of the sky and tree limbs. For the frost to appear white, it is the time to over-expose the photograph. The dark tone of the birds will yield subtle colors and details. This image was shot at 100 ISO, 1/60 second shutter speed, and F8 aperture. I chose F8 to bring a larger depth of field to the image, yet knew sharpness didn’t matter for the background. The fog had not lifted too far from the ground, and was a mono-chromatic white. The reason that snow or white subjects need to be over-exposed is due to the nature of the camera’s light meter. The light meter reads the world as 18% gray, when it reads 0 (or the center of the meter). To compensate, the exposure needs to let more light into the camera, so the whites look white. This second image has foreground, midground and background. I wanted to show the fore and mid ground in focus, and let the fog become the backdrop for the image. This photograph was shot at 200 ISO, 1/60 second shutter speed, and F10 aperture. It gave me the depth of field I was wanting to show in the image. The use of the tree branches at the top helps create a feeling of depth in the image, and help show the subject. This last image was a long-needle pine tree covered in hoarfrost. The ice crystals still maintained their crispness, and the cones were a nice contrast to the rest of the photo. I used a shallower depth of field to blur the background, and bring the viewer’s focus to the cones, needles and hoarfrost in the front of the image. The exposure for this one is 200 ISO, 1/60 second shutter speed, and F5.6 aperture. ← Learning Your Digital Camera can be Fun! I LOVE Winter Photographs!! These are gorgeous (Especially the pinecone = fav) You need to post some more because these are totally not enough. Thanks for suggesting your blog! I’m glad you did! Thank you Brittanie. 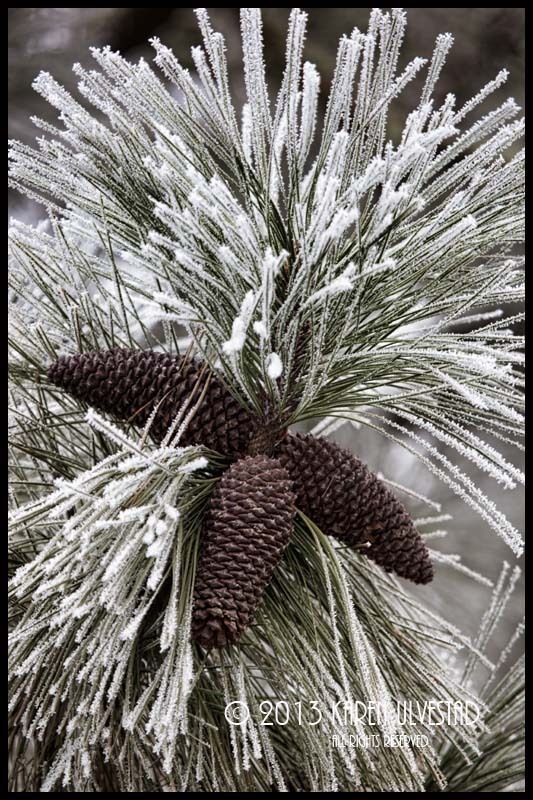 . .
Pine cones against frosted needles, excellently done! You are very kind to share your shooting tips-settings…thank you. Thank you Phyllis. . .I share shooting tips and settings, so that others can learn and expand their vision. This is the type of information I teach in my workshops, along with locations. . .